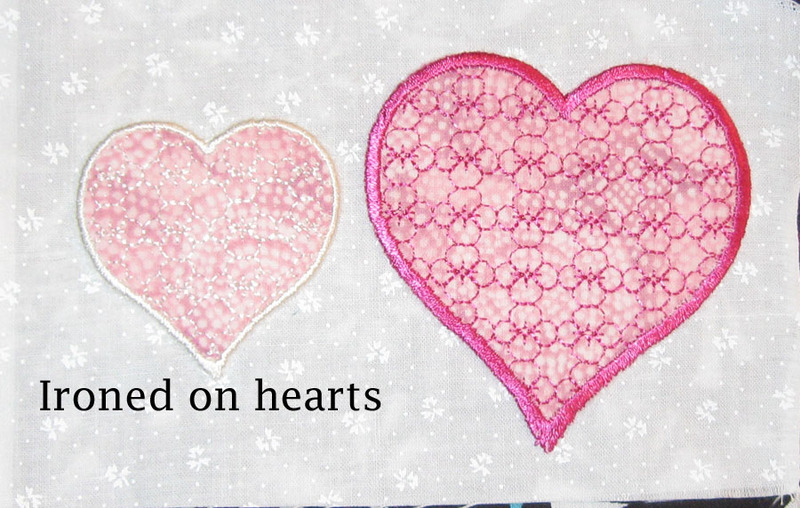 I decided on adding AccuQuilt Go hearts to the Lotta Love wall hanging. Once I had the layout determined, I decided I wanted to add embroidery to the die cuts as well. However, adding embroidered applique to an already completed quilt sometimes adds risk to getting them placed "just right". So, I decided to create the appliques and then iron them on using steam a seam2. Once ironed on, I'd stitch down for security. I tested out my theory on a few practice hears and scrap fabric. 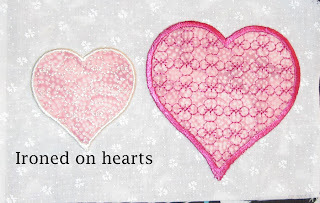 I digitized my hearts to add a decorative stitch all over the heart and then a satin stitch on the outside. Later, after the wall hanging is quilted, I'll add rhinestones to the decorative stitching. I embroidered the design on sulky sticky/tearable stabilizer. Once the embroidery is completed, I tear off the excess stabilizer. This leaves a fuzzy residue on the outside of the embroidered item but since it's white going on a white background, whatever I can not get off will not be noticed as much. 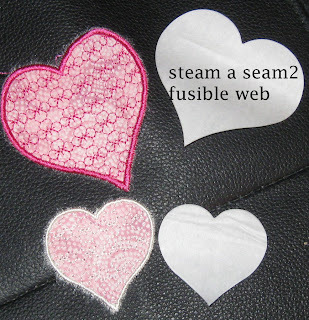 I cut and add the same size steam a seam2 fusible to the back of each heart and then iron it down on my project. Here are my test photos. 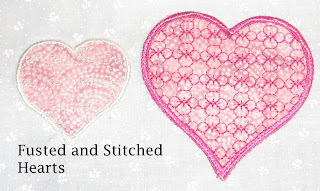 I wanted to make sure they were secure so I tested out adding a layer of stitches to each heart. I wanted to see what a stitch on top of the satin stitching looked like. It's OK, you just have to be perfect. On my actual hearts, I used white embroidery thread for the satin stitching so a white stitch on top of it would not be noticeable. 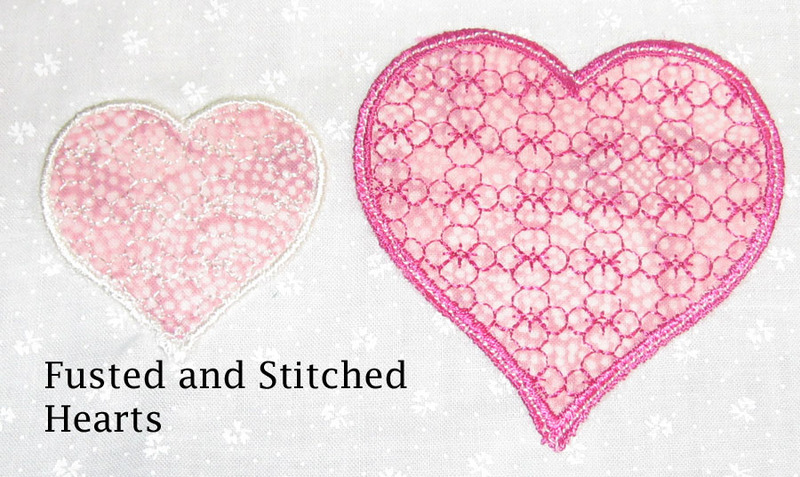 On the smaller heart, it was easier to go just inside the satin stitching to secure the fused heart. Now that the practicing is completed, I turned to the wall hanging. 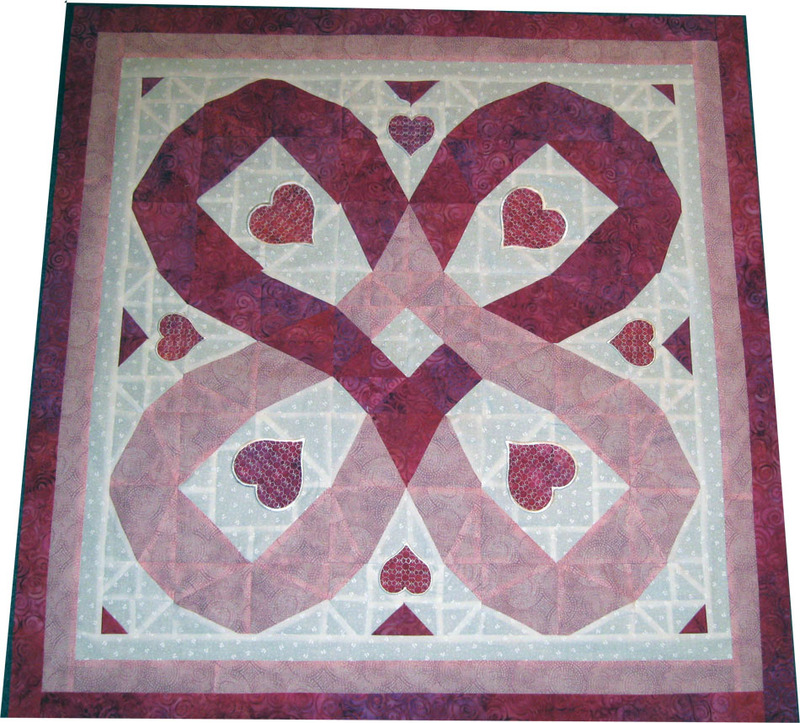 I carefully placed the hearts onto the quilt with the Steam A Seam2 fusible web and ironed them to secure them to the quilt. NOTE: Be careful if you used polyester thread on your embroidery. It burns easily. Ask me how I know :-) You just want to secure it enough to hold until you stitch it. Now it's on to securing them with stitching and then I can quilt it. 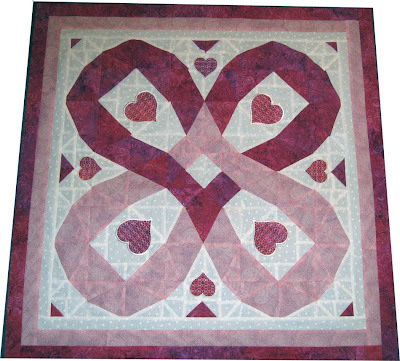 Unfortunately, I'm not the best free hand quilter so I probably will just stitch around the hearts in the ditch.